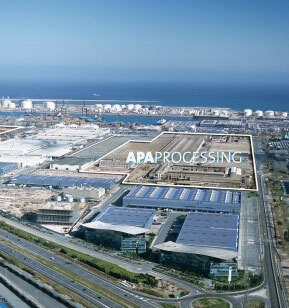 APAPROCESSING plant is located in the Logistc Park of Zona Franca in Barcelona, a privileged and strategic location thanks to its excellent transport links, in the heart of the main Mediterranean agrifood region. Location in the metropolitan area of Barcelona which, with 5 million inhabitants, is a major centre of consumption. Direct access to an excellent road communication network, as well as to the port and the airport of Barcelona. Proximity to Mercabarna, the gross market of Barcelona that gathers more than 800 companies dedicated to manufacture, sales, distribution and import-export of fresh food. Several international logistic operators located in the Logistic Park, were APAPROCESSING is placed and which connect the industrial state with the world. Proximity to the major logistic platforms of important distribution chains. An unbeatable location for the distribution of food to the domestic and European markets as well as for export further afield.